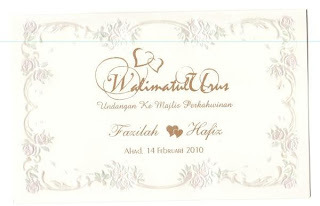 Three wedding days on the same day, 14 February 2010. Praying that all happiness is yours and showered by love and blessing of Allah..
To all of them, i am really sorry for not attending your big day.. Nor Fazilah (Nor) is my roomate during my first year at Mahallah Sumayyah. At that time, we stayed at 'Bilik Usrah' and really close too. I also knew the good guy who is becoming her husband-to-be. Congrats dear~! Nur Hidayatul Hanani is one of my IRK friends. She is so 'bertuah' to get Amir as her husband-to-be. Amir is so kind and i'm trusted him to repair my lappy with so reasonable price. Congrats to both of you and be happy~! Ashraf is a former president of Comrade for two years during my active days in degree years. He was once be my brother in a foster family at aborigine village, Sg Lon & Kg Renglas, Cameron Highland. I also knew Atikah, she is also a good muslimah. Be a good husband & wife, insyaAllah.. Mabruk~! I dedicate this song by Maher Zain, BarakAllahu Lakuma, which this wish is a Sunnah of the Prophet for those who follow the sunnah of marriage and practice a good teaching of Prophet in their new family life..